Just ahead of the blizzard, which blanketed Park City with three feet of snow (testing even the most veteran festivalgoers) a welcome touch of cinematic class blew in from Europe in the form of Luca Guadagnino’s Call Me By Your Name. The Italian director is no stranger to Park City having shown his I Am Love here five years ago. That film went on to garner critical acclaim and a Golden Globe nomination in 2011. Love, like last year’s A Bigger Splash hinged on Guadagnino’s collaboration with his muse Tilda Swinton. 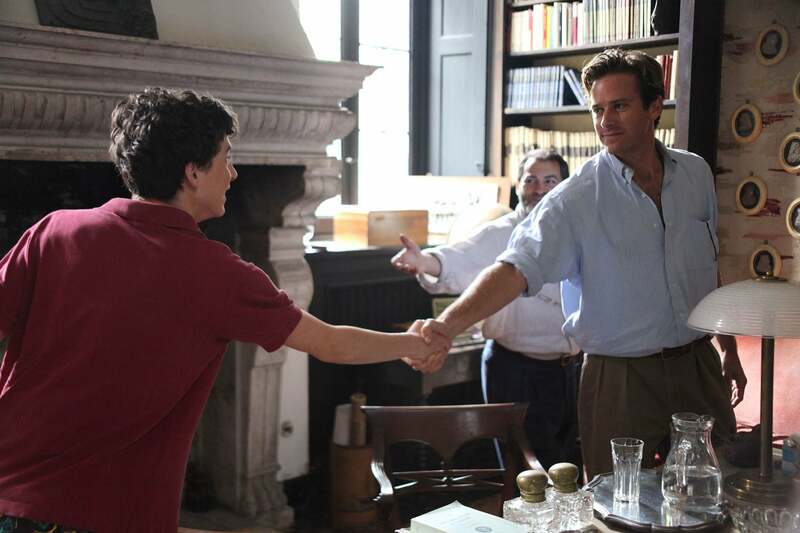 This film, an adaptation of André Aciman’s novel of the same name is a poignant coming of age story revolving around the budding attraction between an American graduate student on a research trip to Italy and the adolescent son of the antiquities scholar (Michael Stuhlbarg) who is putting him up in his lovely Northern Italian villa. Guadagnino’s deft, Bertolucci-inspired direction and the easy chemistry between Hammer and Timothée Chalamet (Interstellar, Love the Coopers). The standing ovation the film received at the Eccles premiere has already led to Call Me being called a “queer masterpiece”. In truth the strength of the movie is how it transcends the easy stereotyping of genre, achieving – in ways that may be unprecedented for a gay narrative – a truly universal story of love, desire and the complicated ways they intertwine in a poignant coming-of-age story. Guadagnino is master of atmosphere and the way he immerses us in the languid milieu of an Italian countryside summer is worthy of Grand-Tour literature. A deft, literary screenplay by James Ivory and the shooting location – the director’s own residence in the Padana valley – don’t hurt either. Of the current generation of Italian directors Guadagnino is the most direct artistic descendant of Bernardo Bertolucci, to whose Val Padan-based Spider’s Stratagem the director himself acknowledges a debt of inspiration. While fans of Bertolucci’s cinema will recognize the fluid, purposeful and sometimes amazingly complex use of the camera (strictly on 35mm film), Guadagnino has proven to be unmatched in modulating hommage with a distinct authorial voice. A Bigger Splash was a reworking of Jacques Deray nouvelle vague film La Piscine, which eschewed the “remake” tropes in favor of a remixing of the original film transposed from Southern France to the Sicilian island of Pantelleria. Guadagnino’s next project is a new version of the Dario Argento cult horror Suspiria which he told us will “pay homage to the original masterpiece” while becoming “its own film in every way”. In the same way he acknowledged the differences between the Aciman novel and his own version of Name telling the Eccles audience “that cinema must not be denied its form”. The result is Guadagnino’s perhaps most sensual film (and that is saying a lot), which breaks new thematic ground while affirming an ever more assured directorial touch. As many have acknowledged here in Park City, Call Me By Your Name has brought a welcome and much-needed whiff of cinema to the festival. Like most every movie here this year, the film has acquired additional poignancy given the current American political context and the ways it could potentially impact the LGBT community. A fact that undoubtedly accounted for some of the emotions in the Eccles audience. Hear what Armie Hammer has to say about Call Me By Your Name. Hear what Luca Guadagnino has to say about Call Me By Your Name. Sundance Review: Call Me By Your Name, feature. Directed by Luca Guadagino. Written by Luca Guadagino, James Ivory and Walter Fasano, from the novel by André Aciman. Produced by Luca Guadagino, James Ivory, Peter Spears and Howard Rosenman. With Armie Hammer, Timothée Chalamet, Michael Stuhlbarg, Amira Cesar.